M60 - Call of Duty: Black Ops Guide! 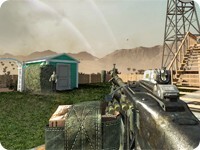 The M60 is unlocked at level 21 in multiplayer. It is the only LMG that features damage drop-off, while other LMGs keep the same damage at all ranges. Within close range the M60 is one of two fully automatic guns that can achieve 2 shot kills (the other being theSkorpion), and can get 3 shot kills at all other ranges. It is almost identical to the M60E4 in Call of Duty 4 with mostly cosmetic differences. The one big difference are its iron sights, which are drastically different to its modern variant. Although it deals high damage, in close ranges the low fire rate can let the player down against other guns with a high fire rate. However, at medium to long ranges, when equipped with a Grip, the M60 can deal huge amounts of damage where other guns such as SMGs would have to fire in bursts. 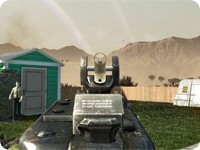 Thus, this is an excellent weapon when firing behind cover, such as out of windows on maps such as Nuketown. Due to the gun's large magazine, the user also doesn't have to worry about reloading. This is useful, as it frees up the Tier 2 perk slot that would be normally taken up by Sleight of Hand. This is especially true with Extended Mags, which places all carried ammo into the box. It is interesting to note that, unlike most weapons, the time for a partial reload and an empty reload are exactly the same. The M60 is an excellent choice for players concerned with running out of ammo. Thanks to the incredibly high damage, large ammo capacity, and manageable rate of fire, the M60 has the potential to bring a player to high killstreaks without the need for Scavenger. Like all LMGs, the M60 suffers poor ADS time and bad hipfire accuracy. However, either of these problems can be resolved with Sleight of Hand Pro or Steady Aim, respectively. Combined with the Hardened perk, the gun can pull incredible amounts of bullet penetration. Hardened Pro is also very helpful for taking down enemy killstreaks, and also to help maintain aim on a target while sustaining damage from enemy weapon fire. Some users may favor Warlord in that this can allow the M60 to have both the Grip and Extended Mags attachment at the same time. 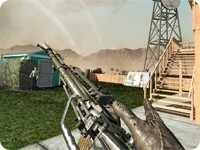 Grip is useful for reducing recoil, which improves accuracy over long range, andExtended Mags is extremely beneficial in that it places all carried ammo within the magazine, meaning the user will not have to deal with the extremely long reload time, which happens to be the longest of any weapon in Call of Duty: Black Ops. When paired with Scavenger, Grip, and Extended magazines this gun is by far the best gun in the game for suppressive fire. This is extremely useful for defensive situations, such as defending a bomb in Demolition.